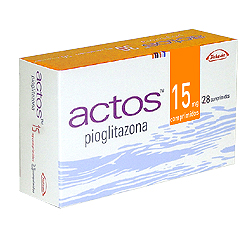 Actos for type 2 diabetes to go Generic in 2012: Actos, a medication commonly used in the treatment of type 2 diabetes, will cost less in 2012 when its generic form will become available as Pioglitazone. The maker/seller of Actos is Merck, and Merck’s patent on Actos will expire in August 2012 which opens the door for a generic form of the medication. 2012 is the scheduled date, but this date can deviate due to arrival dates, litigation or regulatory issues. For now, though, the hope is that Actos will become available in generic form in August 2012. With the high cost of any medication that is not available in generic form, the purses of American consumers have been hit hard over the past years with newer and better medications to treat their illnesses. Drug companies spend many years researching and developing a drug for human consumption with as few side effects as possible. These years of research and development are a costly endeavor. The only way for the companies to recoup their expenses in developing the medications is through the patents that they have over the medication for a specified number of years. Once the patent has expired, the generic form of the medication becomes available through a variety of pharmaceutical companies. These generic forms of medication cost a great deal less. As the cost of medication has risen, many people have cut back on their expenses by not taking their prescribed medications or reducing their dosage. This leaves the patient vulnerable to a medical emergency from which they may not survive. With the reduction in cost of any medication the patient may be taking, the easier the financial hardship on the patient and the more likely the patient is to take their medication at the prescribed dosage. Generic medications are the chemical equivalent of the original brand-name medication and work just as well for nearly all patients, and the cost of using a generic medication versus an original brand-name medication can be drastic. As an example, Protonix, a medication used for severe heartburn, went off patent recently. Protonix now costs on average $16.00 a month for a generic form of the medication whereas the original brand-name medication is around $170.00 per month. A huge difference. With each original brand-name medication that goes off patent, that means bigger and better savings for the consumer. This entry was posted in Diabetes News on July 25, 2011 by admin.